This .410 bore ammunition fires 5 pellets of 00 buck and is designed for magnum .410 bore shotguns and revolvers such as the Taurus Judge. These shells produce a muzzle velocity of 1,230 feet per second, comparable to low-recoil 12 gauge loads. Each box contains 25 shells. 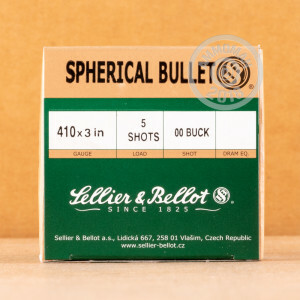 Sellier & Bellot is one of the oldest ammunition companies in existence. Based in the Czech Republic, S&B is known for producing low-cost, reliable ammunition for hunting, self-defense, and target shooting. 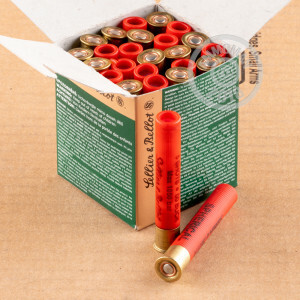 Stock up on all your ammo needs at AmmoMan.com with our free shipping promotion! All orders over $99 come with free shipping regardless of package weight or ZIP code (if otherwise eligible for shipment).